Today, at the first-ever North American Climate Summit, over 50 local leaders from across the world continued discussions about bottom-up climate action and reaffirmed their commitment to the global fight against climate change. Former President Barack Obama gave the keynote address and endorsed America’s Pledge, an initiative that compiles and quantifies the actions of U.S. states, cities and businesses to reduce their greenhouse gas emissions consistent with the goals of the Paris Agreement. America’s Pledge is co-chaired by Michael R. Bloomberg and California Governor Jerry Brown and released its Phase 1 report, “States, Cities, and Businesses in the United States Are Stepping Up on Climate Action,” in front of the international community at last month’s UN climate conference. Obama said, “Thank you to those whose leadership has been critical in creating America’s Pledge – Michael Bloomberg and Governor Jerry Brown. They have been working on climate change issues for a long time and they continue to show the kind of leadership that is needed at this moment. And most of all, I’m here to say thank you to all of the mayors, whose work requires you to actually work and not just talk. 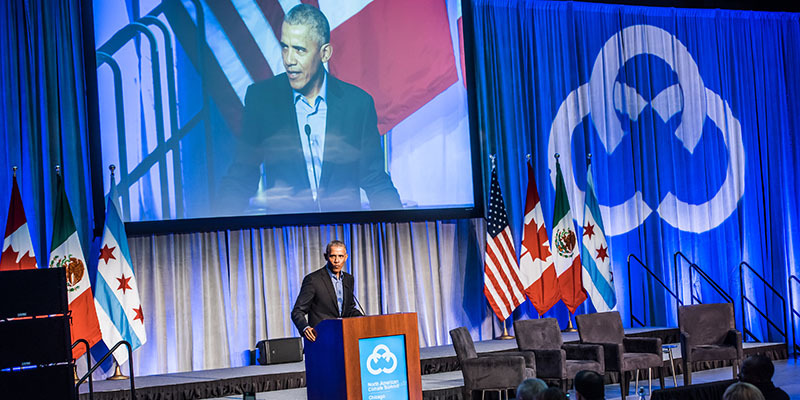 Video of President Obama’s remarks is available here, with pictures available for download and use here of Obama and mayors from around the world who attended the Summit. This includes the Mayors of Pittsburgh and Paris, Bill Peduto and Anne Hidalgo, respectively, who are leading climate change efforts in each of their cities, regardless of what’s being said in Washington, DC. Since the Trump Administration’s decision to pull out of the Paris Agreement, American states, cities, businesses, universities, and citizens are taking action into their own hands to fight climate change. America’s Pledge, led by Michael Bloomberg and Governor Jerry Brown, aims to showcase this collective momentum on climate change, and to ensure that in the absence of federal leadership, the United States remains a global leader in reducing emissions and delivers on the country’s ambitious climate goals of the Paris Agreement. For more information, visit AmericasPledge.com or follow us on Facebook and Twitter @AmericasPledge.